The Grohtherm 1000 is packed with advanced technology and offers optimum functionality. Its organically flowing lines blend smoothly into all modern bathroom decors and coordinate perfectly with numerous Grohe washbasin faucets and showers. 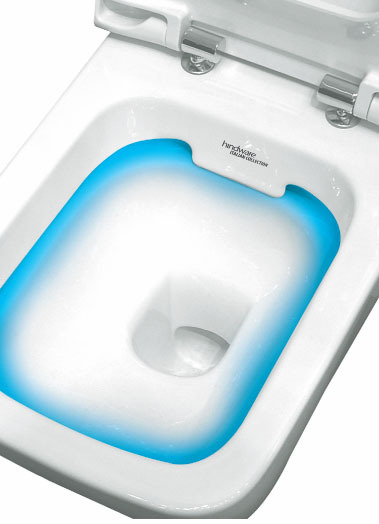 Despite its diameter of only 43mm, its slim body is all about stability and safety, incorporating as it does the proprietary Grohe CoolTouch® technology. A newly developed insulating ring keeps the hot water away from the thermostat body, thereby preventing its surface from heating up. In addition, the thermostatic cartridge has been shifted towards the left, thereby shortening the hot water channel within the unit and ruling out the risk of scalding on the chrome surface. The complete Grohtherm 1000 range is available for concealed installation, for bathtub and shower installation as well as for use as a central thermostat and shut-off valve. These products, too, feature solid metal handles. Add to this the SafeStop button and the EcoButton on the shower and bath versions, with the latter also having the AquaDimmer function. The QuickFix design of the chrome-plated rosettes allows for a quick and easy installation. 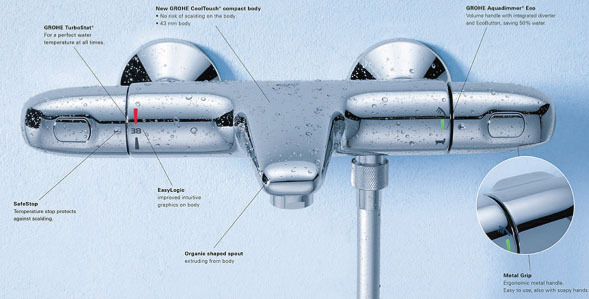 The concealed shower and bath thermostats are best installed using the Grohe Rapido T universal body, which is designed for a safe and straightforward installation process. The Grohtherm 1000 boasts of a number of improvements in terms of its sustainability credentials. ts volume control handle is equipped with an EcoButton, which allows reducing the consumption of shower water by up to 50%. The volume control handle of the bath thermostat features the AquadimmerEco mechanism for smooth and economical switching between bath filling and showering mode. The Grohtherm 1000 features the unique Grohe TurboStat® technology, which allows water temperature to be adjusted accurately and instantly without wasting water while searching for the preferred temperature setting. 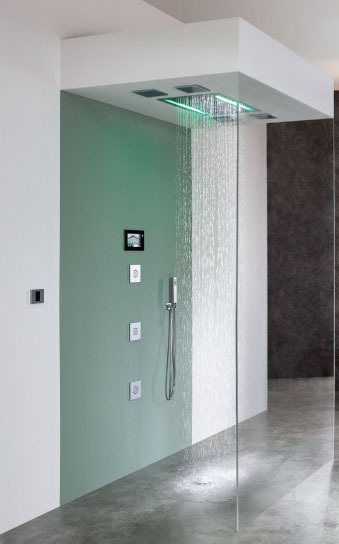 Once temperature is set, the thermostat will maintain it reliably for the entire duration of the shower by balancing out any pressure fluctuations in the water pipes, without the user even noticing it.